As soon as I saw Mojito Madness, I knew it was a must have for my collection. I don't have any greens like this. 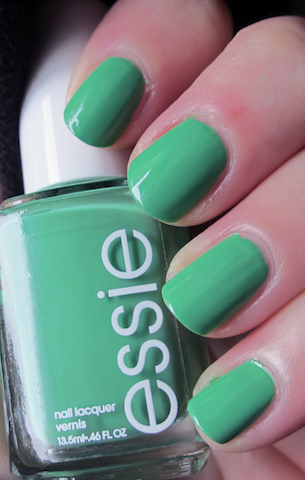 Essie describes it as a fun-loving lime green. The consistency of the polish was great - it was very opaque in two coats. It's such a unique green and I'm excited to wear it this summer! Awesome green! I lov it! Oh my goodness, this is definitely going on my wishlist! I'm a sucker for green polishes, even though they give me lobster hands. This one is so pretty! I'd love to see a comparison between Essie Pretty Edgy and Essie Turquoise and Caicos.. it looks like this falls somewhere in the middle! You are right, it does look liked it falls in the middle. I don't have Pretty Edgy, but looked it up. I could do a comparison of Turquoise & Caicos next to this though! I highly recommend this color, it's so unique! Isn't it lovely! I am kind of itching to wear it again but I have so many untrieds.